IronGear Dirty Torque + Blues Engine pickups were designed to work together to give the optimum conjunction of power, clarity and flexibility and to bring every last ounce of tone from your guitar. This set works best when you're using the bridge pickup for solo/riff work and the neck for cleans/rhythm playing. It also has the added benefit of a truly useable middle position. The perfect upgrade for Pacifica / SuperStrat owners! This set comprises of the jalapeno heat of the IronGear Steam Hammer bridge pickup, and the Tequila kick of the Texas Loco in middle and neck positions. The combination provides superb balance and depth of tone + plus enough kick to take down a moose. The SUPERCHARGED upgrade for Pacifica / SuperStrat owners! 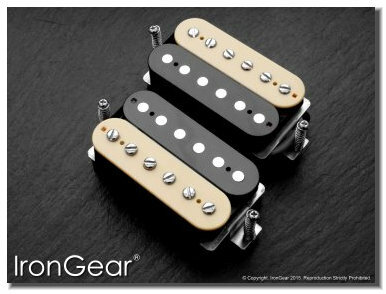 This set comprises of the jalapeno heat of the IronGear Steam Hammer bridge pickup, and the fabulously HOT Pig Iron Overwound in middle and neck positions. This set is for those who have little or no regard for the neighbours. Similar in character to the outstanding Dirty Torque + Blues Engine set, the combination of the IronGear Hot Slag & Rolling Mill gives incredible power, tone and flexibility at a price which is hard to believe! A great set for those looking for maximum tone and clarity. The Rolling Mill in the bridge position is a superb classic rock pickup. With the addition of a single coil Alchemist 90 at the neck giving superb clarity for cleans and "slice through the mix" rhythm work you have a unstoppable combination. Options: Chrome, Chrome or Gold Covers.